The Mosquito FB.VI – a magnificent all-rounder | Shortfinals - aviation and more! The de Havilland Mosquito was, undoubtedly, one of the most effective aircraft of the Second World War. Building on the firm’s extensive experience in constructing wooden aircraft, the projected performance figures of this streamlined, compact bomber, powered by two Rolls-Royce Merlin engines should have convinced the Air Ministry. There were two small problems, however. Firstly, it was made of wood, a construction material that the RAF had just spent nearly ten years trying to wean themselves away from, and secondly, it had NO defensive armament. How, did the Air Staff want to know, could it possibly survive against enemy fighters? The answer – speed, and still more speed. The aircraft’s only champion inside the RAF at this point was Air Marshal Wilfred Freeman, the Air Council’s member for Research and Development, who saw the Mosquito for what it was – a world beater! Despite official indifference, and a ‘freeze’ on work on the programme during the Battle of Britain in the summer of 1940, a contract for 50 aircraft – 20 bombers and 30 reconnaissance aircraft – was issued. It wasn’t until the prototype, carrying the manufacturer’s ‘second class’ marking ‘E-0234’ had flown, and had demonstrated near 400 mph speed and superb manoeverability, that any level of official enthusiasm was shown. Later, a separate order for a fighter version armed with 4 x 20 mm Hispano cannon and 4 x .303″ Browning machineguns was issued under Specification F.21/40, in May, 1940. This was soon altered to a radar-equipped night-fighter, the NF.II. It wasn’t until early 1942, that an attempt was made to combine the attributes of the fast, low-level Mosquito bomber, and the hard-hitting punch of the fighter. An NF.II, serial number ‘HJ662’, was modified as the prototype FB.VI. The fighter’s machinegun and cannon armament was retained, and the underfuselage doors divided into two sections, the first portions covering the 20mm cannon breeches and ammunition feeds, and the rear section (operating independently, of course) covering a bomb bay holding 2 x 250lb bombs. Two further 250lb bombs could be carried under the wings. Powered by the reliable Merlin 21 or 23 engine of 1,460hp, this was designated the FB.VI, Series 1. After 300 similar aircraft had been constructed, the specification was changed. The FB. VI, Series 2 had a stronger wing, and had the Merlin 25 of 1,620hp; this version could carry 500lb bombs instead of the 250lb ones, and it had provision for under-wing long-rank drop tanks (50 gallons each side). The definitive FB. VI had a maximum speed of 378 mph (cruise speed, 255 mph) with a maximum range of 1,855 miles. Production ramped up quickly; 1,218 were built by de Havillands themselves, 1,200 by the Standard Motor Company Ltd. and 300 by Airspeed Ltd (a subsidiary of de Havilland). The ‘new’ FB.VI was quickly in action, with No. 418 Squadron at RAF Ford, converting from the Boston III to perform night ‘intruder’ sorties and day ‘Ranger’ patrols over Continental Europe by May, 1943. The FB.VI reached the South East Asia Command and Burma by late 1943, although numbers were small, and there were technical difficulties. From the Spring of 1943, the Mosquito FB. VI wreaked havoc all over Occupied Europe. Literally nothing on the ground, in the air or at sea was safe from this superlative machine. By December 1943, the first squadrons of RAF Coastal Command had converted, and the FB.VI was ranging far and wide over the Bay of Biscay, attacking U-Boats and long-range Luftwaffe aircraft; ‘HJ719’ had been used to test the carriage of 8 x 60lb rocket projectiles (RPs) in early 1943, and Coastal Command began sinking German shipping wherever it could be found. The Banff Strike Wing in Scotland (Nos. 235, 248 and 333 Squadrons) converted from the Beaufighter in December 1944, and began attacking targets off the Norwegian coast, and when the shipping wouldn’t sail, they attacked them in their harbours. No. 2 Group, RAF, used the FB. VI to perform precision, low-level raids, such as ‘Operation Jerico’, involving the breeching of the walls of Amiens Prison, to free Resistance leaders, on 18th February, 1944, and the attack on ‘Shell House’ in the centre of Copenhagen, on 21st March, 1945, which was the headquarters of the Gestapo in Denmark. The FB.VI was used during the defence of the island of Malta, and the attacks on Sicily and the Italian mainland which followed. Mosquito squadrons, of course, formed a vital part of the air campaign over Normandy by both day and night, as the Allies surged ashore under cover of the largest air armada ever seen. Several units, such No. 515, and 615 (County of Warwick) Squadrons employed a specially modified version of the FB.VI in the later stages of the war. The machineguns were removed, and an American designed AN/APS 4, Mk XV radar, in what was known as an ASH ‘thimble’ housing, was fitted in the extreme nose of these aircraft. This type of radar was intended to be used against shipping, where its narrow beam, and the slow speed of the enemy vessel would make it eminently suitable. The RAF used it by night, and against aerial targets, which meant that the radar operators had to be very skilled. However, this didn’t stop 605 Squadron being very successful, and they made their 100th kill over Fassberg, Germany on the 24th December, 1943. Post-war, the FB.VI was used by No. 84 and 47 Squadrons in Java to assist the Dutch authorities by making attacks on insurgents (they did not leave until 1946), and in the British Air Forces of Occupation in Germany, until replaced by Vampire jets. For example, ‘RS679’, coded ‘A-UP’, of No. 4 Squadron, was still based at RAF Celle, in Germany, in late 1949 (4 Squadron was, in fact, the ‘re-numbered’ 605 Squadron, the paper exercise taking place on 1st September, 1945). The Mosquito was still in demand, however, and the newly-reconstituted French Air Force, Czech Air Force and the new state of Israel all acquired them, post-war. 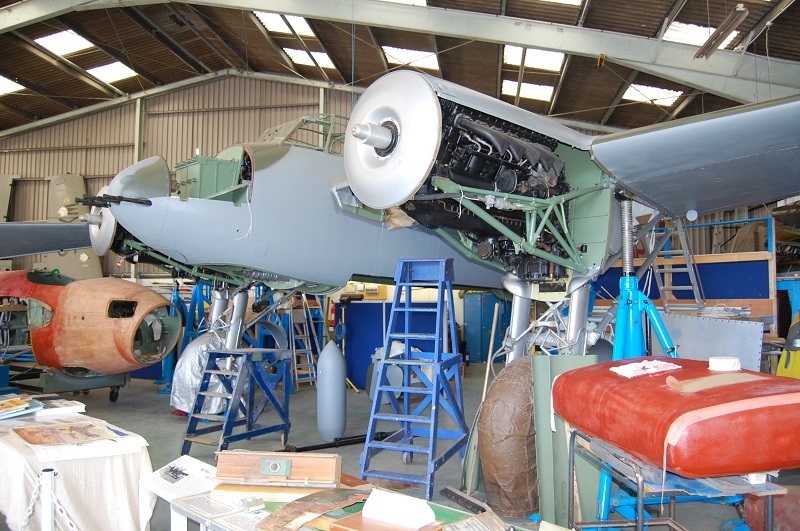 It is almost impossible to write a SHORT narrative about any version of the Mosquito, and the FB.VI deserves a whole book, but I cannot leave the subject without mentioning the magnificent efforts of all those involved with the recovery/rebuild and restoration of the aircraft you can see above. This is ‘TA122’, the only surviving FB.VI in Europe. Built by de Havillands at their main works at Hatfield, and delivered to the RAF in March, 1945, it is now located at the de Havilland Aircraft Heritage Centre at London Colney, and is shown in the markings of No. 605 (County of Warwick) Squadron at Volkel, Holland in April/May, 1945. It did actually see action, making one night attack on 4th May, 1945. How the aircraft has come to reach this state would take yet another book, but suffice it to say that the fuselage was recovered from a Royal Netherlands Air Force base, the wing (in a very poor condition) was brought back from a kibbutz in northern Israel, and they were completely rebuilt and reassembled thanks to the de Havilland Aircraft Heritage Centre and its staff and voluteers. This process started in 1997 and the finished aircraft is absolutely superb. More than a very nice write-up and you know so much more than what you’ve written! Encore!!! The engine mounts are gorgeous, Ross! The mechanical engineer part of me wants to just caress the welds. Absolutely, Frank! Everything about this restoration screams ‘quality’. I understand that she MAY be pushed outside and the engines run at some time in the future, as Rolls-Royce returned the Merlins in ‘flight status’! If you look to the left you can see the disassembled PROTOTYPE fuselage (in red dope). Yes, W4050 is undergoing a rebuild. I’ll be writing more about the various Marks of Mosquito, as we go along. Cheers! Been a few years since I visited the centre good to see the prototype being rebuilt too, and I heard back then that there are plans to try to re construct a Hornet. Is there any news on that? There is a Hornet cockpit which is being worked on, that I do know….also a VERY interesting DH 88 Comet rebuild! Watch this space as they say. I’ll be covering more on W4050 (and other Mossies) later!